Hi there. Well, I've arrived at Anaheim, just settling in and getting ready for CHA. 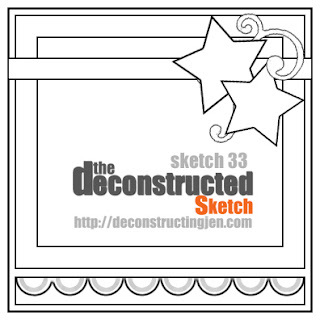 Today is my very last post as a guest DT girl at Jen's deconstructed sketch. I've had the best 3 months on the team. Thanks Jen and all the girls. Jen's sketch this week is awesome as usual, and it suited the saturated canary digi stamp I used perfectly. I hope you have timeto visit the DT girls blogs (links on my sidebar) and hopefully join in the fun. I'll hopefully be back soon with some CHA happy snaps.....never know who i might meet. For this weeks deconstructed sketch i have used another saturated canary digi stamp. Her name is VIOLET and she is SO cute. This weeks sketch suited me perfectly, as i'm still away on Summer vacation with limited supplies, and the CAS look was easy to achieve using Jen's fab sketch. After you've checked them out, make sure you head over to jen's deconstructed sketch blog and join in the fun. Hope you're having a crafty week. I'm heading off to CHA in a few days, and would love to catch up with some blogland friends, so if you'll be there, let me know and maybe we can arrange to meet up. Yes, it's true. I really do. I have just discovered Krista Smith's amazing digital images, and they are so gorgeous. You know when just looking at something gives you that happy feeling, well that's what happens to me when i see Krista's images. I used a jillibean soup Kraft tag for the base of my bookmark which i stamped with a hero arts text stamp and stitched. I colored her in using copic markers and then cut harriet's name out using mft's new alpha die. Don't fotget to check out all the other entries this week on the saturated canary blog. Hi there all. Finally the internet is back to a near normal pace again, so all should go smoothly with my post this week. LOL! Once again, Jen has come up with an awesome sketch for DS34. I have only just recently discovered Krista Smith's SATURATED CANARY digi stamps and I am totally in love with them. This girl is called COPICA, (for obvious reasons), and my gorgeous youngest DD said to me, "she looks just like you, Mummy". It was so cute. If only. Unfortunately, the only likeness is the copic markers, LOL. Hi everyone. I hope you all enjoyed the festive season. Yay, it worked. Jen's sketch this week is awesome as always. Wow, both pictures have uploaded. What a relief. I hope you find time to be inspired by all the DT creations, (links on my sidebar), and please join in the fun. We are sponsored by Scrappin great deals this week, and the winner will receive $25 of product. Hopefully the internet will be working better soon once all the tourists leave the beach, so fingers crossed that i can post more often next week.